For you or I it might not be that uncommon to enter the end of the year with a lower bank account statement than last year, sure it is something that we try to avoid but it is always kind of hard to not spend a little extra around Christmas. For Square-Enix, on the other hand, their “little less” for this year is around 134 million USD (or 13.5 billion yen if you want to make it sound like a more unreasonable amount of money). The reason for the short fall, interestingly, is being firmly placed on anything that wasn’t developed in Japan—you know, the titles that they released that either managed to be released anywhere outside of Japan, are not pointless cash-ins, or aren’t a floundering MMO. It is interesting that of all of the bestselling games that came out, for months, most of them happened to be in some way connected to Square-Enix. 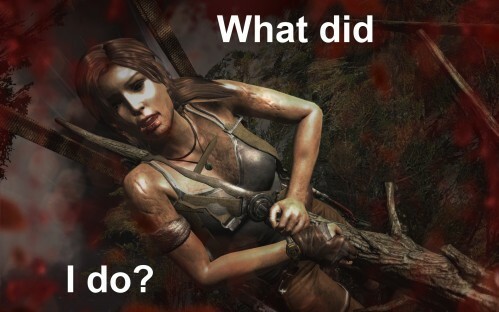 Tomb Raider was at the top of the charts for more than a month and it still managed to be treated as “underperforming”. I would normally say something about worrying that Square is going to take the wrong message from this, but they have already stated that they have. It isn’t that these games didn’t make money for the company, they did, the company projected that they would do more to offset the cost of other, probably terrible and Final Fantasy based, products. Because aside from cellphone games that reuse sprites from two decade old games and charge you 2 dollars for a new character, I don’t even know what that company makes any more. Over the years Final Fantasy has lent its name to an ever increasing plethora of items, spanning both genres and mediums. It seems that it was probably only a matter of time before a rhyme game came out bearing its name. Taking inspiration more from Elite Beat Agents and less from Guitar Hero or Vib Ribbon, the general feel of the game is something of a greatest hits feel—taking both the most memorable songs and characters from all of the games mashing them all together. For me the experience of some of the more classic Final Fantasy has always been one of enjoying the gameplay and story, and less about the music. Expect for some very notable standouts most of the music is only memorable because it is heard repeatedly over the course of 40 plus hours. Granted, most of it—for the time it was coming out—was entirely better than contemporary music gracing other games; that does not mean that it stopped me from muting my TV and listening to something else while grinding or dungeon crawling. It is interesting to play the game and hear the same exact 16-bit music coming out of my 3DS speaker that I heard repeatedly when I was fighting bosses nearly twenty years ago in Final Fantasy 4. It even adds an odd sense of victory that, while playing a song that seems to be ingrained in my memory of childhood, that I manage to land a perfect chain on the highest difficulty. With that disclaimer in place I should also point out that almost none of the music post Final Fantasy 7 has any special meaning to me. This means that the game basically has three titles that have music tied to my early life, and then a bunch of odd instrumental music that I am expected to repeatedly play to gain experience. Besides the music, the way that the game functions is rather interesting. When the player starts the game they are asked to select a group of four heroes to venture through the game with. To begin with there are the main character from each of the thirteen titles, with more unlocked the more the game is played. In the beginning the characters only seem to be different in the skills that they know, as most of the stats are pretty much the same across the board for about the first twenty levels. The skills vary, but are mainly spells from the games or abilities that the characters knew at one point—Cecil for example learns both cover and dark wave. The problem is the entire lack of information that the game gives the players. While playing the game I had a couple of questions about character unlocks and went to Gamefaqs to figure it out. While there I found out that besides learned skills some of the characters are simply better than others depending on the type of stage that they are in. The game never really addressed this at any point, and it was pretty much left up to the player to discover that when they were in the battle phase of the game that when it said “Damage” on the enemy character sometimes that was hurting it more than when it said it other times. As far as I can gather the stats only make a difference in two out of the three types of game modes, the adventure section that has the characters walking across the game field and having them move faster depending on how well the song is being played, and the battle area where notes fly at the characters to be tapped out in time with the beat to do damage to the enemy. The adventure mode almost feels like reading sheet music as the notes can be dragged up and down, tapped out, or simply held for a time to go with the song. The battle areas are very similar, but without the movement of notes. These are both interesting and enjoyable aspects of the game that mix pretty well with each other, too bad that the same can’t be said for the movie section. 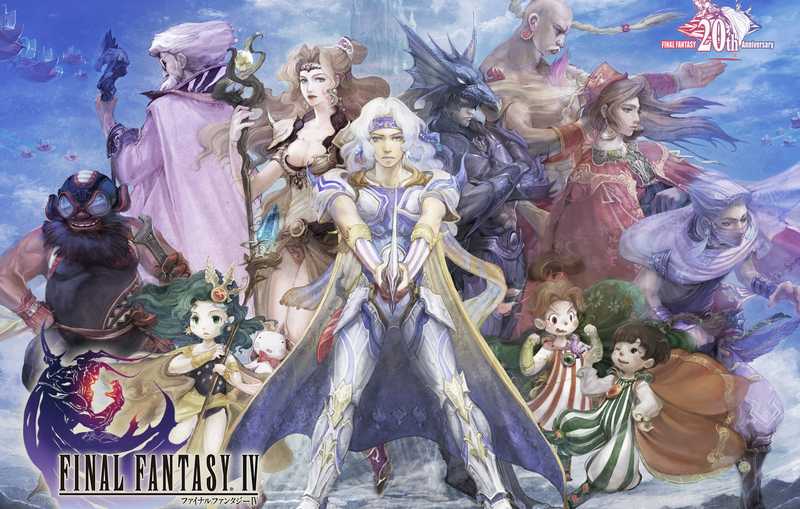 There is a game type where large chunks of the story, from the respective Final Fantasy games, are played on the top screen while the player does the normal tap, flick, or hold commands on the bottom. The problem is that while in the other two modes it felt more like reading a standard scrolling music score, this feels more like Elite Beat Agents where the player is following a circle across the screen and hitting the commands when it lines up. It isn’t that it is poorly designed, even though some of the movies playing make following it rather difficult as everything that is happening in them is vastly more interesting than the music, it is just that the other modes are so similar that skills from one easily transfer to the other, and this seems to require an entirely different section of the brain to play. All of my complaints aside this really does end up being a crazy fun to play. The nice art style that manages to tie twenty-five years of gaming together, the way that the characters utter randomly functional sentences out before a stage begins, and an oddly addictive loot and level up system all work together. Instead of feeling like something that was forced out into the world before it was fully done cooking like so many recent titles in the Final Fantasy series, this seems to have been a labor of love and dedication that brought this out. In all honesty I have been looking for a good game to keep in my 3DS that I can either play for extended periods of boredom or brief windows, this game seems to finally be the perfect match for that unscratched itch. Don’t let it get to this, Square. We beg of you.